The Storm Bringer is not a meme! If the treasure is the one from K&C, then I can see some interesting combos with the 3 mana draw 3 card. If this card picks treasures based on Dungeon Run cards, this card is absolutely busted. The treasures are all 4 of Marin's treasures, but you CHOOSE. Broken, gonna get nerfed in a few months. Wait, it DISCOVERS something that Marin the Fox picks at random? This card is baller. It's like Marin on steroids. Ok so here we go. Shuffle three Malygos in your deck for 1 mana. Wonderous Wand for three 0-cost Malygos. Maly Rogue just went from 8 out 10 to 50 out of 10.
edit: And Myra's Unstable Element to empty your deck to guarantee it. Way better then Marin, since it's a battlecry AND you discover the spells! All the villain legendaries are very good. I might have to craft all of them. Oh man we're gonna get tired of seeing this guy. This will define the meta, rogues will be insane and it'll inevitably get nerfed. I think it's broken .. 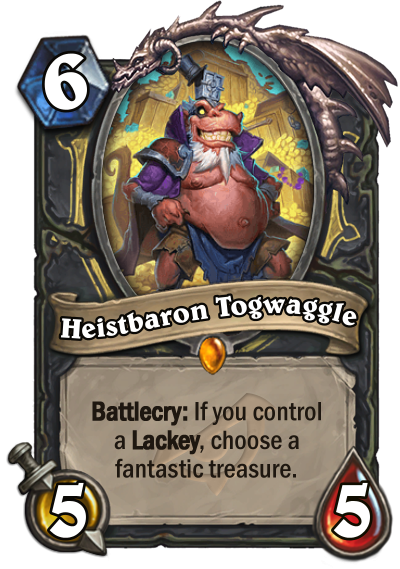 There is going to be some absolutely insane combos with Togwaggle giving the Wondrous Wand and then using shuffling cards like Lab Recruiter and Togwaggle's scheme.